After their midweek heroics AFC Bournemouth were beaten 2-0 at Cardiff City, with early goals in each half putting the game beyond the visitors. Bobby Reid scored the Bluebirds' opening goal in the early exchanges, slotting home a penalty after a handball, and while Andrew Surman hit the bar before half time, the same Cardiff striker netted again to double the lead 17 seconds into the second half, taking advantage of hesitant defending to give the Cherries a steeper slope to climb. The Cherries pushed forwards for the remainder of the half but with a deep-lying and well-marshalled defence in front of them, a comeback rarely looked like materialising in the Welsh capital. Ahead of the chilly but still teatime kick-off, the teamsheet showed that injury had ruled out Callum Wilson and David Brooks, opening the way for January signing Dominic Solanke to make his Cherries debut from the start, assisted in attack by Wednesday's two-goal hero Joshua King. Jefferson Lerma fit enough for the bench. 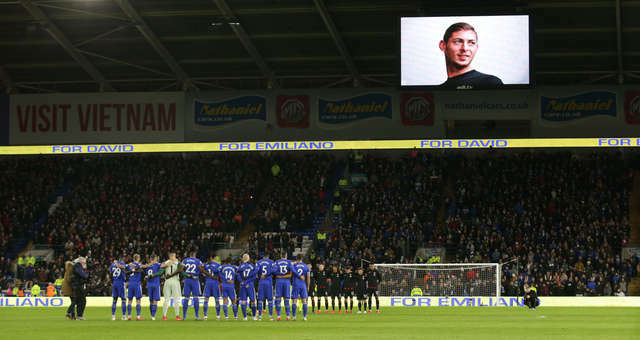 Following a period of reflection in tribute to Emiliano Sala and David Ibbotson, the game got under way, with Artur Boruc making an early save with his legs to thwart Oumar Niasse who had made a strong run into the area. Inside five minutes the hosts had a golden chance to take the lead, awarded a spot kick after Steve Cook's flailing arm made contact with a crossed ball and resulted in a Cardiff penalty. Reid made no mistake from 12 yards, firing down the middle to give his side the early advantage. Boruc was quick to act again when he rushed from his line to beat Josh Murphy to Niasse's low centre, but the hosts were soon sitting deep, inviting the Cherries onto them with men behind the ball and looking to break with pace when possible. Ryan Fraser was central to Bournemouth attacking plans, and he swerved an effort just wide after Solanke's reverse pass had given the Scot a yard of space just inside the apex. Past the halfway mark in the opening period and the away pressure was building, 'keeper Neil Etheridge made a brilliant save to divert Surman's 20-yarder onto the crossbar and from the corner only Callum Paterson's near-post intervention denied the Cherries. The possession was largely with Bournemouth but the Cardiff threat continued with Adam Smith alive to smother Murphy's cross away from Paterson who was ready to slot home at the back post as half time approached. Solanke's quick feet at the head of the area set up King, but not catching his effort quite as he'd have liked the last kick of the half landed in the grasp of Etheridge. Straight from kick-off 15 minutes later the Cherries found themselves two goals behind, Reid beating the offside trap, rounding the onrushing Boruc and slotting into the empty net, to the despair of the Bournemouth defence. The visitors with it all to do, Stanislas burst into the box only to be crowded out, too often Cherries passes not finding their targets as the side entered the final third. Eddie Howe made a double change just past the hour, Jordon Ibe and Lys Mousset replacing Stanislas and Solanke. Ibe's free-kick from the left flank hung invitingly for Nathan Ake to flick barely a foot wide, but with ten minutes remaining the away side had yet to really trouble Etheridge with an attempt on goal in the second half. The pressure continued to the end but while crosses and through balls tried their luck Bournemouth were unable to get a clearer chance than Ake's to register and provide a footing for a late comeback. After watching on against his former side on Wednesday night, Solanke was thrust into the action at the Cardiff City Stadium, leading the line with King, Fraser and Junior Stanislas for company. The incoming striker's main bright sparks came when he linked up play effectively, holding the ball up, allowing team-mates to join the attack before laying the ball off, a 61-minute debut that hinted at more to come from the 21-year-old. Bournemouth came into the encounter buoyed but not only two straight wins but also two clean sheets, but early in each half they were made to pay defensively. Cook's handball gifted the onus to the home side minutes into the first half and seconds after the restart the visitors were caught cold as a ball over the top by Aron Gunnarsson beat the entire Cherries backline. Those two moments gave Cardiff exactly what they wanted, a lead to defend and the opportunity to pile bodies back, creating a thick wall for their opponents to try to break through and then looking to Niasse's speed with direct passes when recovering possession.